A panel of hand-selected expert speakers have been brought together to share their opinions on the topic. Partnering with me in favor of millennials is Rachel Flint of Hubbell Homes, based in West Des Moines, Iowa. Millennials are smart, efficient, socially conscious, patient, honest and much more. I’ve been excited about what I have learned about this misunderstood generation, and Rachel and I are excited to share some of the research that leads us to believe that millennials are the trendsetters in housing. The debate will be held Tuesday, January 19, 3:00 to 4:30 p.m. in South 231. This Building Knowledge Session is targeted toward designers, architects, engineers and planners, and land development and sales and marketing professionals, and is eligible for the following continuing education credits: NAHB – 1.00 CE hour, NKBA – 0.1 CEU, AIA – 1.50 LU hours. Rachel and I will be debating against Douglas Van Lerberghe of KEPHART and Jennifer Wallace-Brodeur from AARP; Stephen Moore of BSB Design will moderate the session. Attendees will learn the generational differences that will inform price points, location and design, the positives and negatives of attracting each demographic group to your community, and which group you should target based on the characteristics of your community(ies). You’ll also learn about the similarities between both groups and how you can accommodate both in terms of design and amenities. So what do you think? What will housing look like in the decades to come, and who is shaping those changes? Will the Millennials follow the same paths their parents did and move to the suburbs? Will empty nesters sell their single family homes and move to more urban, walkable locations? The Great Debate: Millennials or Boomers just might change your mind. Remember that seating at Building Knowledge Sessions is first come, first served, so get there early to be sure you get a spot! See you then. 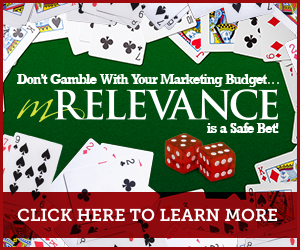 The image in this post previews Marketing RELEVANCE’s inaugural exhibit booth at IBS 2016! The booth will be held in nextBUILD #C2665. The booth’s “Lucky 7” theme is in honor of our company’s seventh year of creating successful marketing programs for clients nationwide. As an incentive for stopping by, you can enter to win some amazing daily prizes, such as an Apple Watch™, and pick up some fun Vegas-themed goodies including Koozies, playing cards, chocolate poker chips and more.